Janina Ramirez and Alastair Sooke discover Barcelona through its art and architecture, including the frescoes that inspired Miro and a surprising collection of vintage fans. With sumptuous palaces, exquisite artworks and stunning architecture, every great city offers a dizzying multitude of artistic highlights. In this series, art historians Dr Janina Ramirez and Alastair Sooke take us on three cultural citybreaks, hunting for off-the-beaten-track artistic treats - and finding new ways of enjoying some very famous sights. 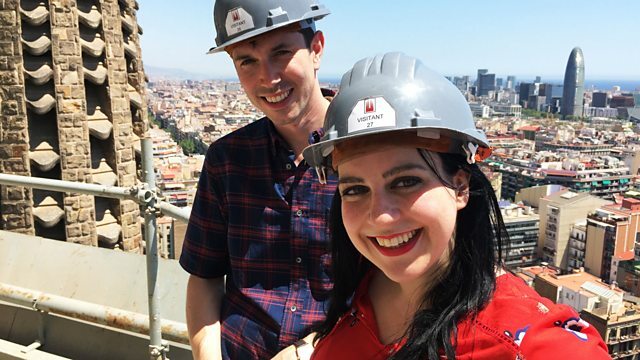 In this second episode, Janina Ramirez and Alastair are on a mission to get to know one of the most popular cities in the world through its art and architecture. Although Barcelona is famous for its exuberant modernista buildings, the Gothic Quarter and artistic superstars such as Picasso, Janina and Alastair are determined to discover some less well-known cultural treats. Escaping the crowds on the Ramblas, they seek out the designs of an engineer who arguably put more of a stamp on the city than its star architect, Antoni Gaudi. Alastair marvels at the Romanesque frescoes that inspired a young Miro, while Janina discovers a surprising collection of vintage fans in the Mares, one of the city's most remarkable but rarely visited museums. Barcelona's Tourist Appeal - Blessing or a Curse?